We told you not to take your eyes off Palm Beach, not even for a moment, with another week and yet another exciting new arrival. We’ve been rubber-necking as we’ve driven past this mammoth building renovation for eight months or so now. Lusting over the enhancements that’ve turned a once unremarkable commercial block into a glistening new landmark restaurant for the fast-emerging precinct of Palm Beach. Live north of Tallebudgera bridge and don’t venture down this way except for rare airport pick ups or the annual visit to Currumbin Estuary? Well trust us, you’re gonna be impressed when you see this beauty under moody light. Balboa Italian is the fruition of a two-year dream for the same crew behind quaint Avvia, a dozen blocks to the north. Eddie and Cherie Uzan had so much faith and early vision in the once-underrated 4221 post code, they knew when opening another restaurant, they wouldn’t be venturing far from the area that first supported them. But they wouldn’t settle for any ol’ venue either. They scoured every vacant space on the strip, before finding a spot with scope to create a landmark restaurant that’d make Palm Beach proud. A fitting title for their bold new project, Balboa means “Italian stallion”, you know, like strength and defiance, you might also recognise the rampant horse as the iconic Ferrari symbol (um, dream car?!). 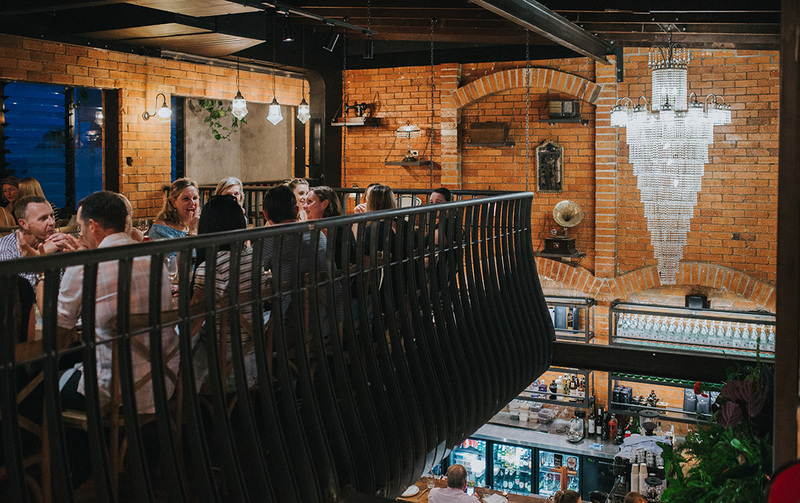 Having kept the 45-year-old building’s original foundations; red clay, double brick exterior; and sections of hardwood beams and flooring, they’ve partially gutted and re-engineered entire sections to create a mezzanine level that adds extra depth to the impressive restaurant. Honestly, they’ve done an absolutely smashing job—managing to capture that old-world charm that’s difficult to manufacture and even more difficult to find in our young city. Balboa’s two-metre high chandelier and red Vespa are sure-fire talking points, as are the antique collectables staggered up the wall—a Singer sewing machine, wireless radio, and gramophone. With all the aged brick, exposed beams, and well thought out lighting, they’ve totally nailed the ambiance and character they strived for. And despite presence of salty Pacific Ocean sea breezes and the fact you’re a pizza toss from the busy old Gold Coast highway, you could be mistakenly transported to old town Sydney or Melbourne’s Lygon Street. Or as Eddie nicely puts it, “get a free ticket to Italy without leaving the country”. A walk through the menu is more-ish on its own. With influences from northern Italy and items rich with cream, butter, and milk (all our fave food groups), to southern Italy and its Mediterranean influences of olive oil, antipasti, and fresh produce and seafood. Naturally, there’s an authentic Napoli-imported wood-fired pizza oven (you can smell the pizzas a block away), plus all Balboa’s pizza dough and pastas are made in house and can also be ordered gluten free. 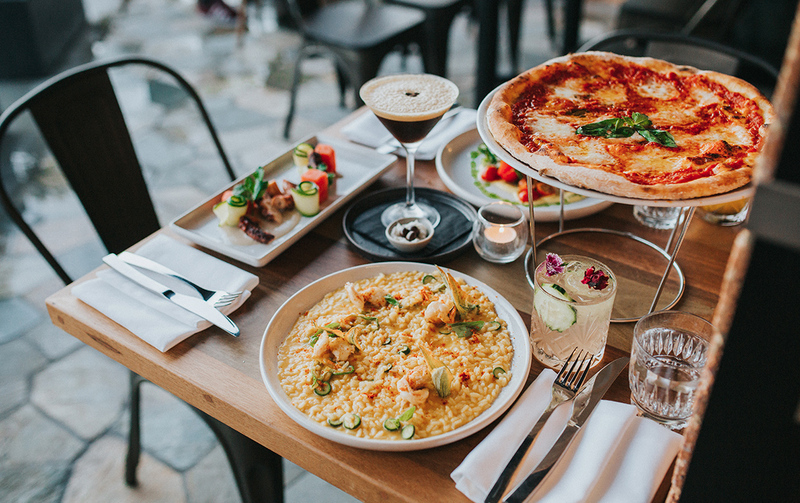 We taste tested our way through a few dishes including a farm-fresh heirloom tomato and buffalo mozzarella salad and the Risotto Gamberi e Fiori di Zucca (or in other words, a flavour-packed risotto with locally-sourced prawns and zucchini flowers). We also chowed down on a serving of roasted octopus with cannelloni bean puree and side of refreshing watermelon and cucumber bites and, of course, a classic margherita pizza to up the carb count. We’re eager for another dinner date to try early crowd favourites such as the chestnut gnocchi with ricotta and black truffle, the Pollo pizza with caramelised pears and chicken, or the share-friendly Zoccolette dessert, which is essentially fried pizza dough balls served with a runny Nutella dipping sauce. Mmmm. And ‘cause Italian eats and wine are simply made for each other, they’ve paired the menu with 45+ bottled options beckoning from inside a glass wine humidifier, including a lovely Chianti from Sienna at just $9 a glass. Good thing Balboa Italian is only a push bike-ride away for team Metropolist, as we’re eager to take another walk through the cocktail menu, too. Think: passionfruit Caprioska where the summer fruit is literally caramelised before your eyes (crème brulee-style), lychee Prosecco mojitos, silky espresso martinis, and a smoked old fashioned with that campfire smell thanks to real wood chips. Not surprisingly, since opening last weekend, Balboa’s phone has already been ringing off the hook, with Christmas parties and work functions starting to fill the reso book. Aside from the restaurant’s regular seating, there’s a small alfresco area out front, stools for hangs at the bar, an upstairs lounge area with Insta shoot-worthy vintage Italian couches, and even a sweet private dining room that sits up to 14 bums. Yep, prepare for your socks to be knocked clean off. And given what they’ve successfully managed to achieve with a once-under utilised commercial space, we reckon there’ll be more old venues around the Coast about to be eyed up in a totally different light. Killing it Palm Beach, 2017 is looking bright!